I'm attracted to the Penguin classic design book and when I saw "How To Be a Brit" at the Last Bookstore in Downtown Los Angeles, it brought back memories of me going to used bookstores in London and finding old Penguin paperbacks from the 1940s. That it has illustrations going through the entire book is an additional plus. I didn't buy it. Two weeks later I saw it at a Tokyo bookstore that has an English language section, and they had a stack of this title. For sure, the perfect book for the foreigner visiting another country. Still, I didn't buy it. It wasn't until I got back from Japan that I went back to The Last Bookstore, to locate this damn book. I did and went to the library to get other titles by George Mikes. I have a fascination with books by foreigners writing about another culture. Mikes originally came from Hungary and lived in London for most of his life. In a sense, he became more British than the British, and on top of that, he knew there is a cultural difference between the British and everyone else. Some of the commentaries are out-of-fashion, but for me, that's not a problem. Even the subject matter is not that important to me. 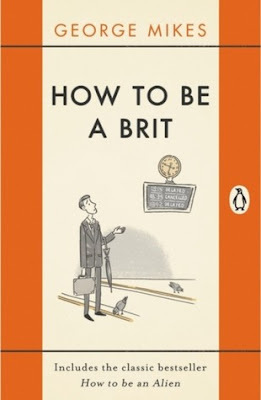 What's important is Mikes' language and his funny observations that border on being stereotyping, but that's OK.
"How To be a Brit" is actually three short books put together. "How to be an Alien," How to be Inimitable, and "How to be Decadent," which sadly has no Sadian touches, but more with how the every day British treat themselves. Nicolas Bentley's illustrations throughout the book are charming, funny, and a reminder of Robert Benchley's world. In fact, there are traces of Benchley in Mikes' work. Both are the absurd humorists commenting on the everyday life of... well, people.